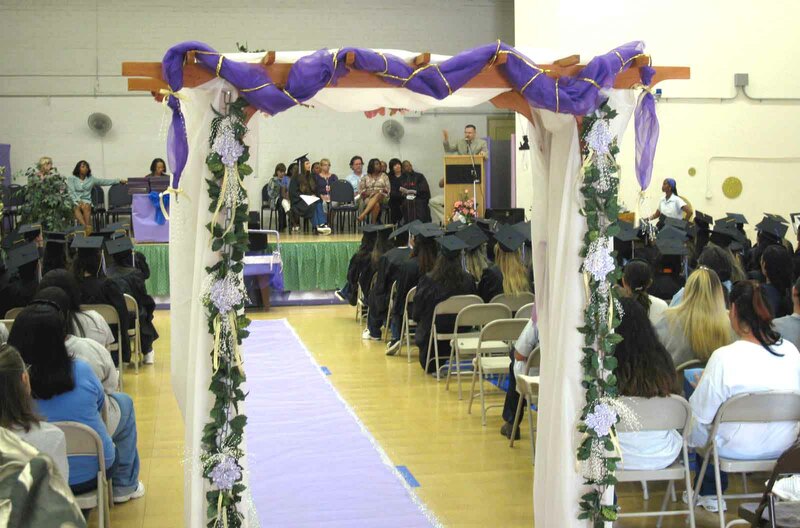 A graduation celebration was conducted recently at the California Institution for Women’s (CIW) El Prado Adult School (EPAS) with 93 inmate students graduating with their General Education Development Certificates. An additional 46 inmate students will be receiving vocational certificates for completing course work in Office Services & Related Technology and Graphic Arts. Seven more inmates will be recognized for their achievement from various colleges in the CIW Distance Learning College Program. Forty-four inmate students were recognized as well for completing coursework in Choice Theory from Loyola Marymount University (LMU) and the William Glasser Institute. This course gives the participant the ability to self-evaluate and explore different options and helps the student understand a better decision making process. The ceremony was attended by notable guests such as Dr. Cheryl Grills, Professor and Chair of the Psychology Department at LMU, and Carleen Glasser, spouse of Dr. William Glasser. CIW Warden Guillermo G. Garcia, Chief Deputy Warden Cynthia Y. Tampkins, along with various administrative and education staff were there to congratulate the inmates’ achievements.